In Heavenly Creatures, Meggs explores the persistence of mythological themes and imagery through a distinctly contemporary voice. 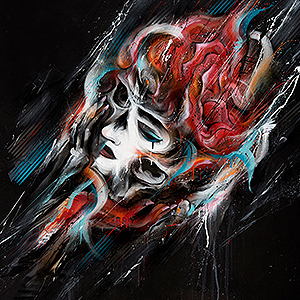 Through his dynamic, and highly detailed, signature mixed media style, Meggs creates characters that merge aspects of the contemporary superhero or comic book character with aspects of the classical mythological entity, revealing a shared thematic lineage despite their seemingly disparate origins. Meggs combines representational elements with expressionistic abstraction, ever seeking to strike a balance between the two. His interest in the ways in which fantasy becomes an arbiter of secular conflict, leads to the re-imagining of familiar stories with renewed energy and relevance. We look to the characters of myth and fantasy to embody difficult polarities and resolve our deepest longings. By tapping into this intensity, Meggs’ explores the power of story in the constitution of belief and ideology. Drawing from our shared identification with archetypal narratives, whether they be culled from ancient mythology or the fantasy of comic books, Meggs’ work appeals to the endurance of these myths, and the ways in which we continue to look to them to reflect our sense of self and other. 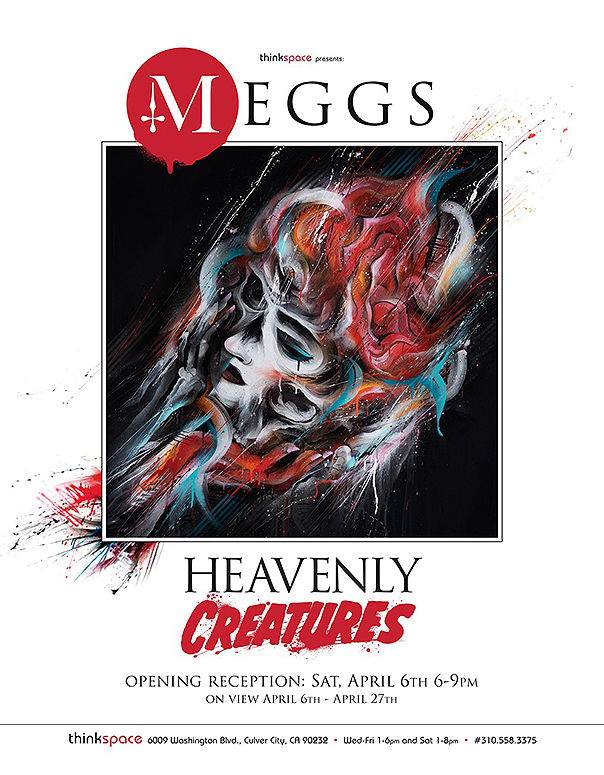 Heavenly Creatures will feature ambitious new works by Meggs ranging from painting, sculpture, and installation. Working across media, the artist will also be creating a large scale thaumatrope as part of the exhibition installation – an antiquated Victorian device used historically to demonstrate the persistence of vision. The thaumatrope in the context of Heavenly Creatures speaks to the stamina of the historical precedent, while also literally demonstrating the recombination of an image as it is optically derived from two distinct parts – an apt metaphor for Meggs’ work. The artist’s interest in fostering an exchange between historical themes and contemporary culture is apparent. Meggs strives to revitalize the aesthetic encounter and to devise new ways for people to experience and engage with his work, whether it be in the context of the gallery, or on a wall in the urban landscape. In Heavenly Creatures Meggs explores the capacity of myth to reconcile the secular with fantasy, and creates work that speaks forcefully to our shared desire for some existential compass.